Gilbert Home Cleaning Done Right. Every Time. 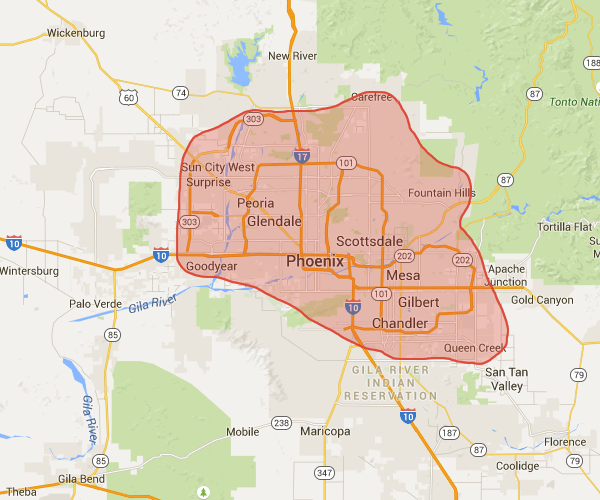 We service all of Gilbert and Phoenix suburbs. If you aren't sure if we'll service your area please give us a call. Most Gilbert residents think that life is too short to spend their free time and energy cleaning their own homes; and they're right! Instead of coming home at the end of a long day to a messy home, come home to one that's been professionally cleaned for you. We're friendly, highly trained, and we're excited to take on any residential cleaning job that you may have. We've been providing the Gilbert area with superior cleaning services for several years, all of which have been specially designed to leave your home sparkling and allow you to focus on the more important things in your life, like family and friends. And you can rest easy knowing that we aren't just in the business of cleaning homes, we're also doing our part to keep the earth clean. Coming home to a messy house can feel like walking into a second job, and can take up your time and energy. That's time and energy that you're not spending doing the things that you love. Our cleaning services are designed to help relieve Gilbert residents of the burden of cleaning their own homes, which helps them get back to doing whatever it is that they enjoy. Your family and your home are as important to us as they are to you, which has led us to focus on the use of green cleaning materials that are environmentally responsible or sustainable. We are one of the few cleaning companies offering these cleaning solutions, but we believe that it goes a long way towards customer satisfaction and healthy living. We use green cleaning products because they don't include many of the allergens and chemicals that other cleaning solutions are made of, which means that they're safe for all home surfaces, and can even improve air quality. When you book your residential cleaning with us, your satisfaction isn't just a possibility, it's a guarantee! We want you to have full confidence in your choice of cleaning service, and our team has what it takes to make that happen. We start our cleaning services by developing lasting relationships with each of our clients, based on trust, communication, and friendly service. We've worked hard to develop a cleaning system over the years that gives us proven results, which helps us to ensure that Gilbert residents are completely satisfied with the final results of their cleaning experience. Even though our cleaning system hasn't failed us in over 5,000 cleans, we're always making adjustments to ensure that it will continue providing proven results for 5,000+ more cleans. Our system is detail-oriented and thorough; key points that emphasize a quality clean. Because we take time to cultivate lasting relationships with our clients, generating loyalty and trust along the way, many of our clients go on to recommend us to their friends, family, and loved ones. We take extra measures in order to earn your confidence in our ability to properly clean your home, starting with making sure that our company is insured and bonded, and that all of our professional cleaning staff has been subjected to stringent screening and training. If you don't want to take our word on the fantastic clean you can expect from our company, take a look at some of our impressive customer reviews. All of our residential housekeepers use our specialized cleaning rotation system, which helps us to make sure that every room in your home is thoroughly cleaned based on your given specifications and our own customized cleaning checklist. As our professional cleaners move about your home, each room is dusted from left to right, top to bottom. We start by knocking down those cobwebs creeping in hard to reach corners, and built up dust from ceiling fans and light fixtures. Our maids always work top to bottom, making sure that nothing is missed or improperly cleaned. This particular cleaning method has proven an efficient way to round up dust and dirt in order to easily remove it from your home. The next thing we'll take care of is your shelves, furniture, counters, and other surfaces. Our maids treat all of these and other items in your home delicately, and according to any special instructions that you've given us. After dusting the floorboards and cleaning your surfaces, we're ready to begin the hard work. At this point, our professional cleaners will begin room specific cleaning procedures, like wiping down surfaces to remove germs and bacteria from your home. Every residential cleaning service includes the finishing touches that make us so popular, like straightening linens and emptying wastebaskets. This is the process that gives a home that professionally cleaned look that Gilbert residents can be proud of. Professional cleaning services can offer tremendous value to homes and homeowners alike, including the money you'll save compared with our competitors, the time and headache of having to clean your own home at the end of a long day, and the improved air and living quality you'll have thanks to our green cleaning products. Book your next professional Gilbert area cleaning from our website, or give us a call today. You're going to be amazed with how clean your home is.